This artist’s concept depicts the Bigelow Expandable Activity Module (BEAM), constructed by Bigelow Aerospace, attached to the International Space Station. The BEAM will be launched to the space station later this year. Over the past six years, the Obama Administration has placed a high priority on developing innovative new technologies that advance our nation’s journey into the solar system on a path to Mars, facilitate the creation of a thriving space economy, and keep the United States of America the undisputed world leader in exploration. This week, Bigelow Aerospace of Las Vegas is marking completion of all major milestones for a new, American-made, space-technology demonstration module to be added to the International Space Station (ISS), another concrete example of how we are out-innovating every other nation on Earth while knocking down the barriers as we push out into the solar system, not just to visit, but to stay. 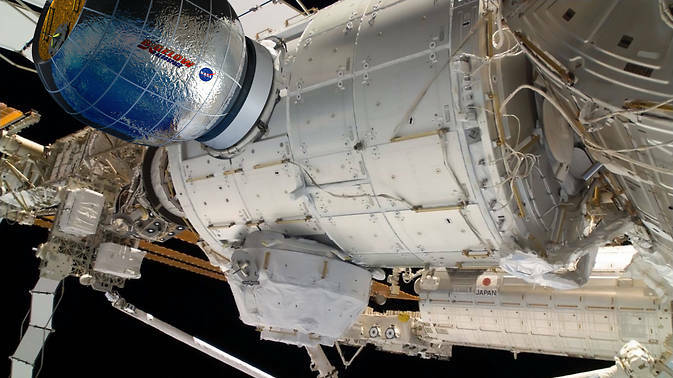 The “Bigelow Expandable Activity Module,” or the BEAM, is an expandable habitat that will be used to investigate technology and understand the potential benefits of such habitats for human missions to deep space. The ISS is an excellent platform to test and demonstrate exploration systems such as the BEAM. and NASA expects that the BEAM project will gather critical data related to structural, thermal, and acoustic performance, as well as radiation and micro-meteoroid protection. All of these data are essential to understanding the technology for future astronaut habitats for use in long-duration space travel. The International Space Station serves as the world’s leading laboratory where researchers conduct cutting-edge research and technology development to enable human and robotic exploration of destinations beyond low-Earth orbit, including asteroids and Mars. This innovative expandable habitat concept is an example of how American businesses and NASA can help to open new markets in low-Earth orbit and pioneer the space frontier. The BEAM is scheduled to launch to the ISS later this year, along with supplies for astronauts, aboard an American commercial rocket provided by SpaceX. The SpaceX cargo resupply mission marks another in the ongoing successful revival of cargo launches from American soil. The U.S. human spaceflight program continues to mark many advances. This year NASA awarded fixed-price contracts to two American companies — SpaceX and Boeing — to safely and cost effectively transport our astronauts to the Space Station from the United States. This will end our sole reliance on Russia for this function. Our newest rocket, the Space Launch System, or SLS, will be the most powerful rocket ever developed. It has already moved from conceptual design to development. This week we also conducted a critical qualification test for the SLS boosters that will help power the rocket to orbit. The Orion spacecraft, in which astronauts will travel again to deep space, performed nearly flawlessly on its first trip to space this past December. NASA is now examining the full set of data that will inform improvements to the spacecraft before it carries humans beyond Earth orbit. The attitude control motor for the Orion ascent abort system recently underwent a successful test firing in Maryland. Technology drives science and exploration. Thanks to American-made advanced technologies being developed by both NASA and our commercial partners, we are moving more rapidly on our journey of sending humans to Mars than at any point in NASA’s history. These new technologies come from NASA, traditional arrangements with longstanding aerospace firms, innovative arrangements with newly emerging companies, and every combination in between. These concrete steps for pioneering space reinforce a proven formula for success. American companies working with NASA are creating the tools needed to keep us on our path of discovery. Today’s NASA understands that the agency can generate more innovation and attract more investment in space by partnering with America’s commercial space industry and its entrepreneurs. Our plans for exploration in the 21st century intentionally rely on American commercial partners in every aspect of what we do, whether it is rockets to get to space or new technologies such as the BEAM expandable habitat for living in space. The United States continues to lead the world in space exploration. We are successful because we are a nation of innovative scientists, engineers, technologists, educators, and dreamers. We are a nation of unlimited potential, where individuals and businesses, small and large, can contribute to our critical work in space. Thanks to that, America’s space program is not just alive, it is thriving.